Can a 2012 iMac still serve as a useful recording studio machine? Can a 2012 iMac still serve as a useful recording studio machine? That is the question I recently set out to answer, albeit unintentionally. Having retired a former 2008 Mac Pro following reliability concerns, a new machine was in order. Running Logic Pro x was my only stipulation having long since moved away from ProTools following the outlandish upgrade costs and an unacceptable number of software issues with a complete lack of customer support from Avid. I needed a Mac – a reliable, dependable one, which meant a Hackintosh (an ordinary PC running Mac OS) was out of the question. A ‘trashcan’ Mac Pro was purchased and sold, and new machines were considered but ultimately fell outside of the budget. By chance I happened across a 2012 iMac up for auction at an unbeatable price owing to poor quality listing images and a vague description. I took a chance and a few days later a mint condition 21.5” late 2012 iMac was delivered and I set about tweaking it for its new home in the studio. At this point I should note that this use is far from unusual. I’m sure there are thousands of iMacs serving recording duties and my usage and upgrades are no different from any other. However opening the iMac was, to me, an interesting experience that I figured I’d document here. The efficacy of 3rd generation Ivybridge hardware with Logic Pro x isn’t well documented either, so I’ll attempt to offer a few conclusions here for anyone considering obtaining one of these machines for use as a DAW. With the Mac booted, a fresh install of OS 10.13 High Sierra was performed along with Logic Pro X, other assorted applications and many plugins including Native Instruments’ Komplete Kontrol 11 ultimate, its libraries stored on the internal drive to achieve maximum performance. My machine was the mid-level 21.5” configuration and the highest available off-the-shelf, featuring a 2.9GHZ Intel Core I5 3470S CPU, 8 gigabytes of PC3-12800 DDR3 1600 memory and a 1TB ST1000LM024 5400RPM drive. 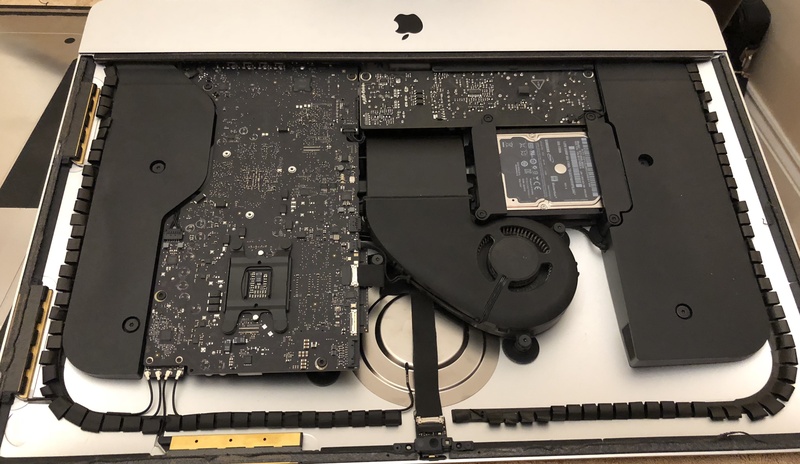 This machine was available built to order with both SSD and fusion drive options, along with a Core I7 3770S 3.1GHZ chip and a maximum of 16GB of memory. As with all machines of the time it was fitted with USB 3.0 and first generation thunderbolt as well as SATA III and support for a blade SSD, though the slot for the latter is equipped only on some models. In its stock configuration the hard drive provided a serious bottleneck to the system. I’m amazed that Apple would cripple an otherwise well-specified machine with such slow storage. Boot time to the High Sierra desktop was just shy of two minutes, and loading a Logic project added another 2 minutes two the load time. Loading Komplete instruments, in particular the large sampled pianos took an age and hit the system’s other bottleneck – a lack of memory – which is invaluable in a studio machine. Though usable in its stock form the machine was slow and extremely laggy and handling projects of more than a few tracks was out of the question. My upgrades coincided with Amazon’s Boxing Day sale. A Crucial MX-300 SSD was purchased, as was a 16GB kit of Timetec memory. I would ordinarily opt for Crucial RAM following a 100% success rate but RAM prices have soared in recent times and the price of branded memory was unjustified. The Timetec kit uses genuine Hynix chips and has so far proven to be reliable and there is no reason to suspect it won’t stand the test of time. I debated upgrading the CPU for the I7 3770S, available on the used market for approximately £110. This upgrade would’ve offered hyper threading, more cache and a slightly higher clock speed, but ultimately pushed the price beyond what the machine is actually worth. The I5 exceeds a 2008 Mac Pro in benchmarks and offers enough power for this application, though admittedly can struggle with multiple demanding live playback tracks. Being a socket 1155 Some say that these machines will take the superior 3770 chip, but with a higher TDP (thermal design power) it could compromise the iMac’s cooling performance so I opted not to test that either. The GT650M GPU would likely bottleneck a CPU upgrade beyond the 3770S and it cannot be upgraded and has a fixed 512 megabytes of VRAM so is quite significantly underpowered by today’s standards, and not suited to GPU-intensive tasks in modern applications. The final piece in the upgrade puzzle involved a few tools and some tape. The iMac’s screen is held in place by six strips of VHB (very high bond) double-sided foam sticky tape. A cutting tool is required, similar to a pizza cutter with a thin nylon blade spinning on the end of a cutting handle. Suction cups are required to live the display, and a tape kit is required to reseal the display afterwards. Finally if you plan to clone your existing hard drive to an SSD, an external drive enclosure will make your life much easier, into which you can install the original Apple drive allowing it to function as would any other external drive. Opening the iMac for the first time is a somewhat nerve-racking process, though with the write tool it’s difficult to cause any serious damage. Care should certainly be taken though as the front glass is thin and fused to the display panel. If you crack the glass you must replace the entire display assembly with a generic replacement costing around £130 for this model and the original Apple displays for this and newer models costing a lot more. The cutting tool is slid into the hair-thin gap between the glass and aluminium shell and dragged back and forth repeatedly until the pivot point is reached and no further resistance is felt. Care must be taken around the camera housing mounted centrally at the top, and accessing the tape at the bottom is impossible with the use of a tool. 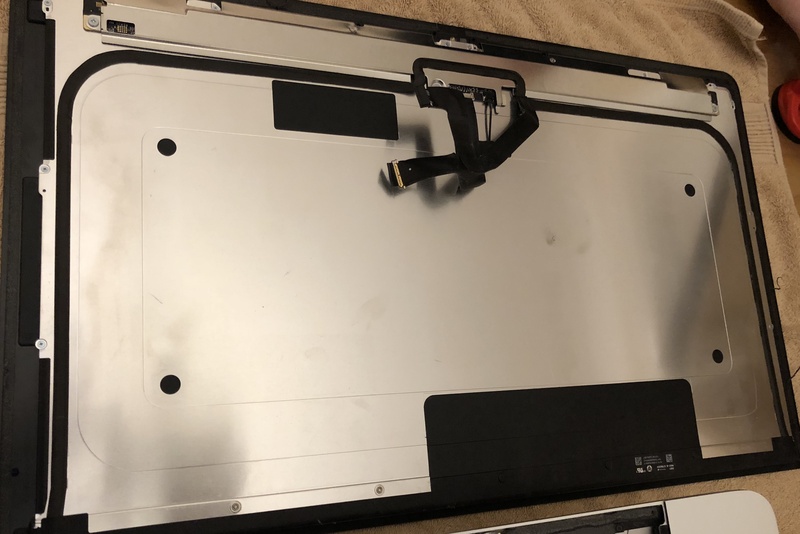 With the tape cut, suction cups are placed on the top corners of the display and the glass tilted forward to allow you to get a hand beneath and disconnect the two cables. The display can then be tilted forward to form a 90 degree angle with the bottom shell of the iMac, at which point the remaining tape should have separated sufficiently to lift the display from the housing. 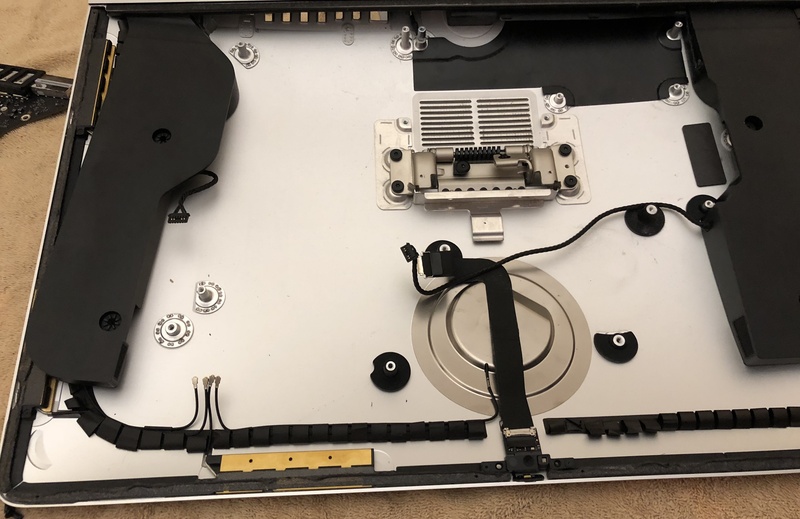 Once open you can view the insides of the iMac including easy access to the hard drive, mounted in rubber vibration mounts which must be removed and stuck to the new drive. The Crucial MX-300 is supplied with a plate to adapt its height to that of a standard 9.7 mm drive. While not strictly necessary in this installation it does make the job neater. A pair of retainers are removed, the rubber mounts transferred and the new drive is ready to be placed into the bay. Not until, however, the RAM upgrade is complete. 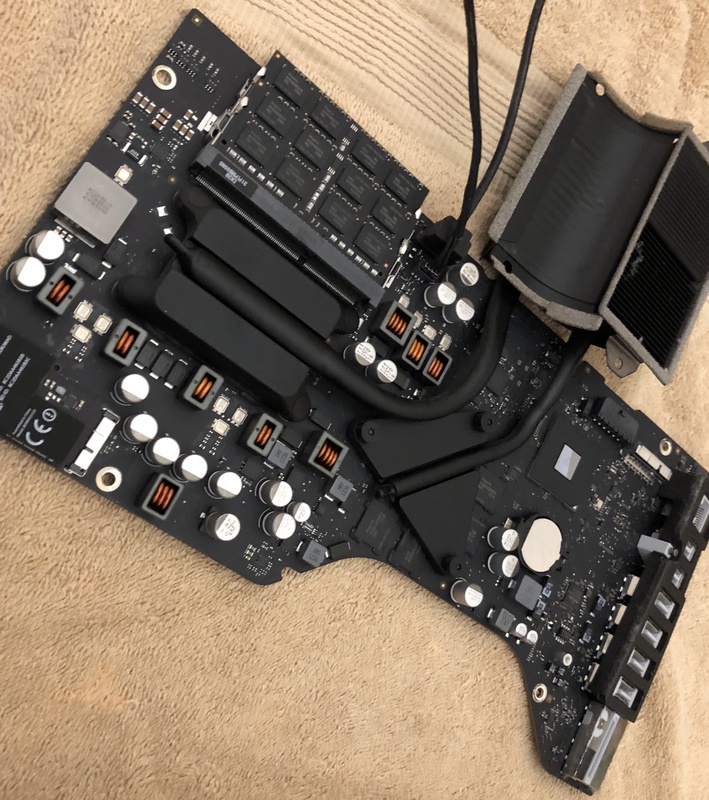 It is a far more complicated procedure involving the removal of almost every component from the iMac case. First the drive bay itself comes out, followed by the power supply – a fiddly procedure owing to some plastic shielding and stubborn cables. The cable nearest the bottom of the iMac close to the speaker has a tab on its side which must be squeezed to release. With the power board removed, the fan can come out and finally the logic board itself, once the cables have been disconnected from it. The most challenging of these are the four antenna connecters which are tight but extremely fragile. They’re easily broken and must be put back in order. Care must be taken when removing the logic board so as not to damage the fragile connectors and SD card reader, the latter blocked by one of the board mounts. Lifting up and to the right should clear it, and during reassembly it is advisable to test the alignment of your connectors with a USB plug before sealing up the iMac. With the logic board removed, the RAM can be found on its underside. Here too is where you’ll find the BR2032 PRAM battery, which is worth replacing with a quality branded battery while you have the Mac open. While electrically compatible with a CR2032, the BR2032 operates over a wider temperature range and has minor differences in amperage and voltage so it is advisable to replace with the correct battery type. Online reports say that a good BR2032 will be good for 10 years, and not having one to hand I left the original in place. With everything reinstalled, the remnants of the original sealing tape must be pealed from both the iMac and display. It comes off with relative ease. When pealing from the top of the display start at the middle so as to avoid accidentally pealing up the metal shielding tape. New strips are then adhered to the iMac chassis according to the numbers on the strips. The display is then stood along the bottom edge of the iMac. It is important to ensure that the display is centred correctly and pressed tightly against the bottom edge of the aluminium shell to ensure a correct fit. If you secure the display without it being correctly centred, it is likely that you’ll damage the tape attempting to correct your mistake and will have to apply fresh strips. The cables are then re-connected and the display laid in place, at which point the edges must be squeezed tightly to adhere the tape to the display. The performance difference is night and day. The speed increase afforded by an SSD is well known and worth every penny of the ever-decreasing price. 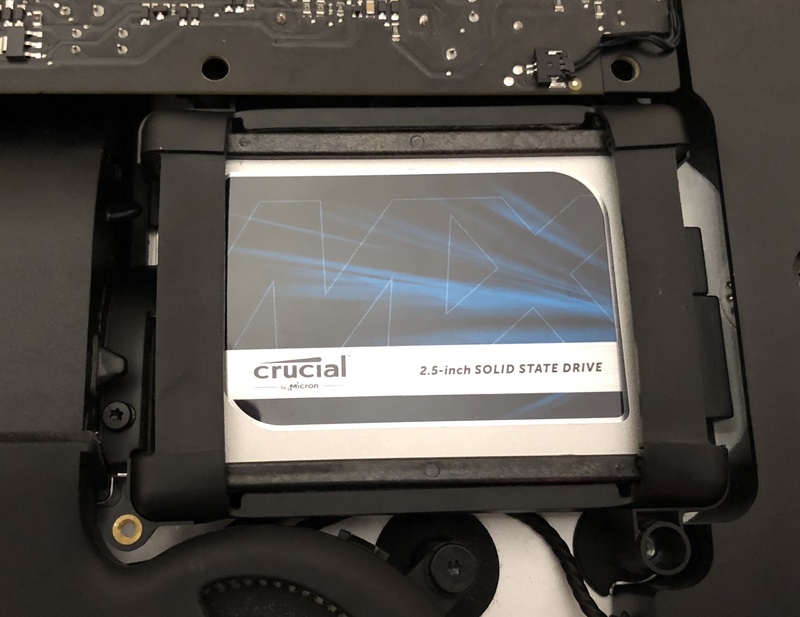 While capped at SATA III speeds and nowhere near as fast as the PCIE-based flash storage offered in newer Macs, the speed boost when compared to the slow stock drive is exponential. Boot time is cut to under 25 seconds and launching applications is near instantaneous. More importantly large instruments and plugins load within five seconds. 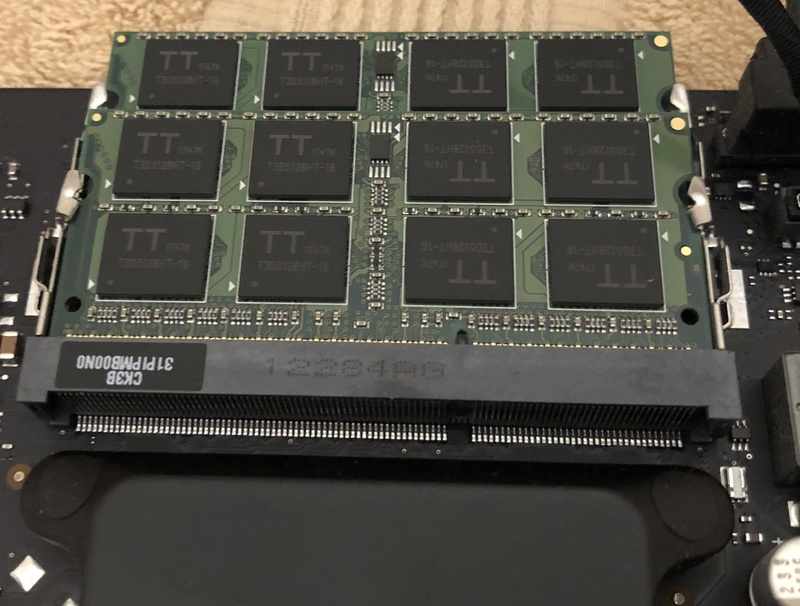 While 16 gigabytes of RAM is a pretty average amount in today’s machines, and more is always merrier, the ram upgrades allows for loading large sample libraries and the SSD is fast enough that swap usage isn’t noticeably slower when you do inevitably run out of memory. In terms of recording, the iMac comfortably handles a project of 50 tracks with a number of plugins on each track, some of them instruments and samplers and some of them simple reverb, EQ and compression. The Mac is quite capable of recording multitrack takes from all 22 channels of my Soundcraft 22MTK, which is an interface allowing for 24-bit recording at sampling rates of up to 48kHz. Live playback through the desk, particularly when inserting plugins on the tracks can be a bit laggy, especially if simultaneously recording an analogue mixdown using the 22MTK’s channel inserts. This is an area where an I7 may have smoothed the rough edges, but in all simple upgrades have turned this late 2012 iMac into a recording powerhouse that has so far handled every project asked of it. The iMac is a remarkable feat of engineering. At only 5 mm thin around its edge rising to a little over 4 cm in the centre, packing so much tech into its enclosure is a commendable achievement. It’s not without its flaws, though they are by design and only concern user upgrades. 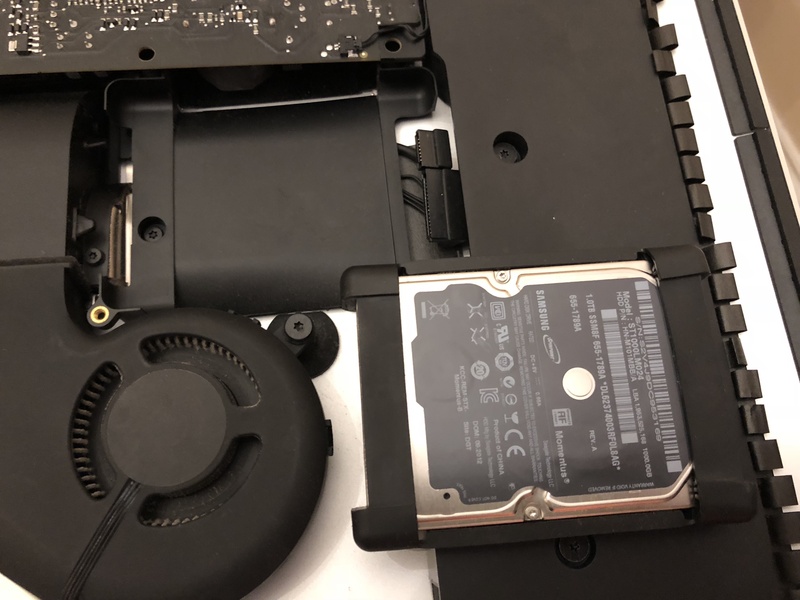 For example placing the RAM and PRAM battery on the back of the logic board would’ve made swapping them a relatively simple matter of removing the display, removing the necessity to disassemble most of the iMac. Used as Apple intended however, the iMac makes for a simple, elegant and surprisingly powerful desktop solution. From an engineering perspective I particularly like the speaker design, which feature dedicated enclosures for surprising bass output and clarity, though if I’m being critical the sound isn’t without a little mid blurring. The speakers are irrelevant in my usage as the iMac remains permanently hardwired to a desk and proper monitors, but regardless flat panel TV manufacturers in particular could learn a lot from Apple in this department. It’s worth noting that Apple did, for a time, begin soldering the RAM to the logic board in the 21.5” iMac models. Recent changes however have seen them return to socketed memory in the 2017 iterations, so user upgrades are once again possible. 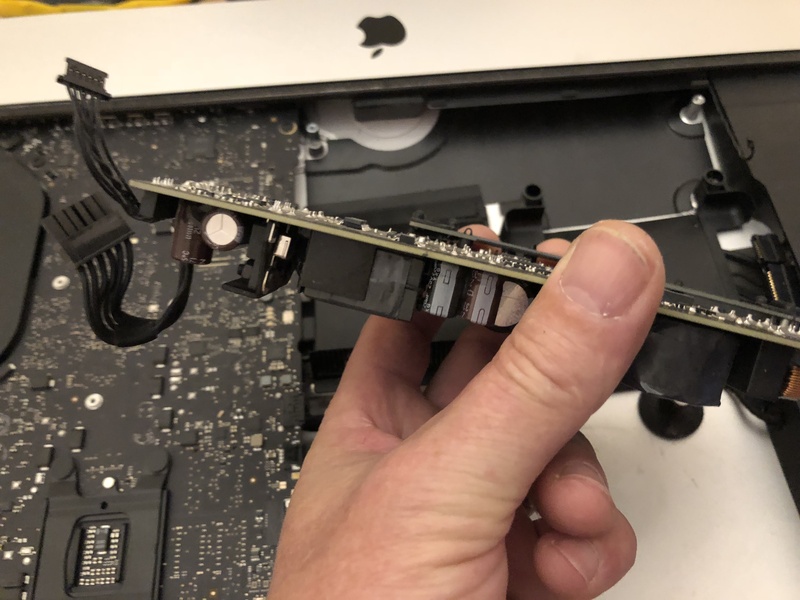 It’s still beneath the logic board, so upgrading a 2017 iMac will still necessitate removal of its costly and extremely fragile display and most of its internals, but it can be done. Finally, a word on thermal throttling. Many people have raised concerns regarding the fan control in the slimline iMacs, stating that the fan cutoff temperature is far too high which causes the CPU to throttle its speed as a protective measure. I have yet to experience this behaviour and I am not using any software to manually control the fan. The machine becomes warm to the touch under load but achieves the full turbo boost speed of 3.6GHZ and does not noticeably slow down, with CPU temperatures staying well within safe limits. The CPU and GPU do share a heatsink in this model so taxing the GPU would undoubtedly cause things to heat up inside. 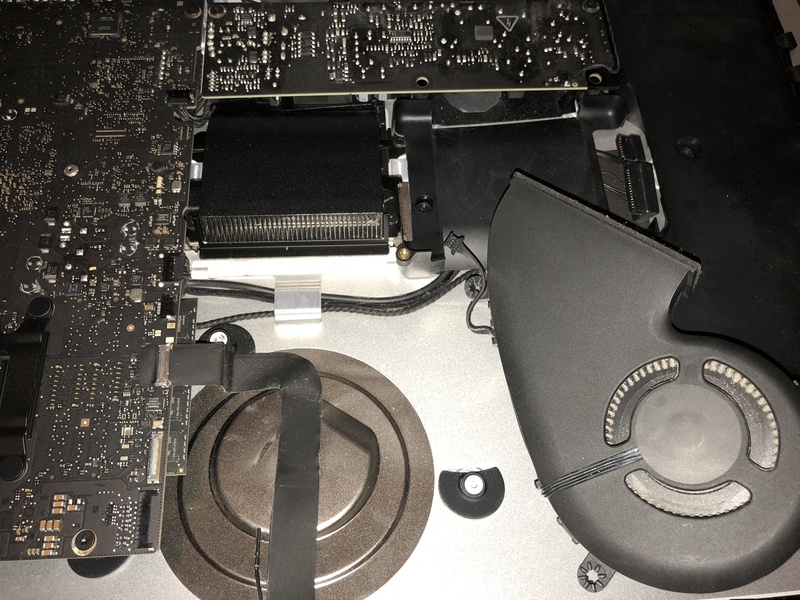 It is possible that encoding video or loading the GPU would cause a thermal throttling situation, but in my experience this simply causes the fan to kick in as intended and providing the heatsink is clean and the airflow path unimpeded the iMac’s cooling performance should be adequate. Disclaimers: I am in no way responsible if you attempt these or any other upgrades on your own machine. Though at first daunting, upgrading one of these machines is not difficult but care must be taken. It is important that you use caution when attempting this yourself to as to ensure the safety of you and your machine. Take care in particular when handling the power supply, and never attempt any modification with the machine wired to external peripherals or the mains. You are solely responsible for your actions and for any damage that may arise.